A Skritt of My Own #GW2 #GuildWars2 – Nomadic Gamers, eh! It’s a little hard to tell in this screen shot, but last night I came across the cutest quest I have ever done in all the years I’ve been gaming. Yes, it was that cute. I had to pick up a little unconscious skritt from the ground, and carry him to safety. 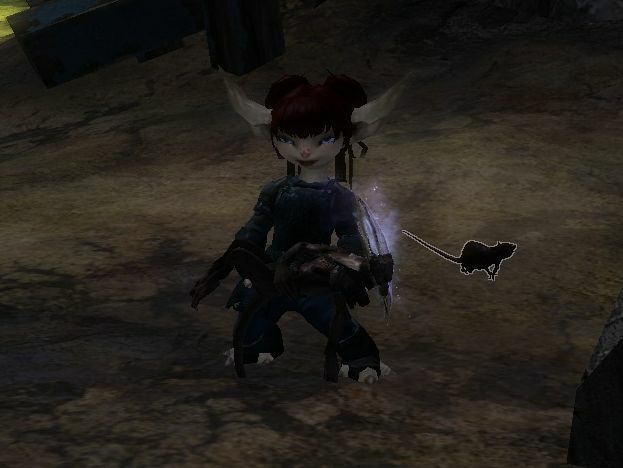 Skritt are odd rodent type creatures, and my little Asura was hefting him around her little ears flopping all over the place as she sprinted to safety. It was so cute I just wanted to do that quest over and over again. The skirtt dangled from my arms and I knew right then and there I had to call him George. I’d squeeze him and love him forever, too. I’m currently sitting at level 22, my cooking is 80 as well as my jewelry making, and things are going well. I’m having fun discovering vistas and exploring. Most of the time I’m auto leveled lower than my basic level because I’m higher than the zone area I’m exploring in, and when I see people who are 2-3 levels below the appropriate level I wonder what it is they’re not doing because I didn’t even leave the starter area (1-15) until I was almost 20. I freely admit, I’m smitten. The game certainly isn’t perfect – absolutely no game is. But as I said on twitter, it IS perfect for me. One of the things I love the most is just how detailed the world is. You can spend hours looking through a city at all the little nooks and crannies, exploring the finer details. There’s things to look at and see everywhere. If you’re only doing the quests and not taking the time to notice that as you run through the plants they rustle, or that as you leave a pool of water your screen splashes with droplets, then you’re missing some of the key things (imo). I am (of course) still playing WoW, and I do still plan on keeping up with EVE (I haven’t done much of either lately, new shiny and what not) but since GW2 is subscription free (and not just some weird varied free to play model) I am only too happy to keep it in my active game roster. The marketplace was finally up for most of yesterday, though the auction house still was not. The only thing in-game that is sold in the market that I don’t find nearly enough of in the game world, are the chest keys. Potions and all the rest I’ve been getting as I complete achievements, but I have a good selection of locked chests sitting in my bank until I decide to take the plunge and purchase some keys so I can unlock them all. I’ve only gotten one key in-game. About the level things, that is something that is puzzling me too. My guess is people are just out in the world doing hearts and events but not doing their personal storylines or crafting, both of which give some XP. I am probably wrong though since my charr was pretty much in the same situation as yours but once he got to the second zone, once he did a number of renown hearts, he started to fall slightly behind. By then I didn’t do as much crafting I did in the beginning and there was less events I participated in too. I was a few levels below some areas (and a couple i was like 20 levels below heh) cause i had wrapped up all the hubs and just wanted to see what the other zones looked like. I get a kick out of seeing how far and how long i can last in other zones :) Perhaps some are like me and just wanting to see whats on the other side of the shimmering portal.